Introducing yet another bazaar at a University close by. 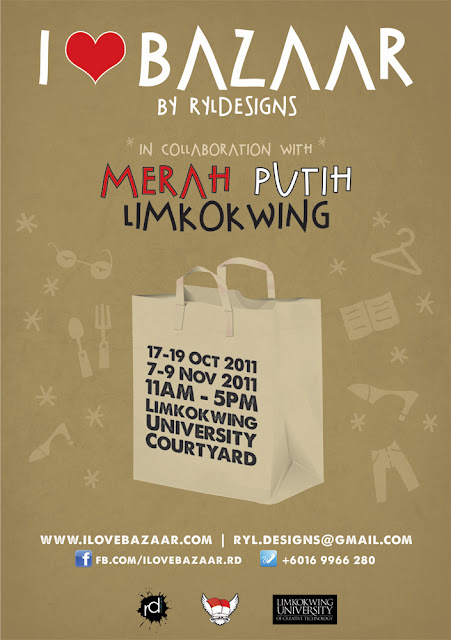 I ♥ Bazaar will step foot at LimKokWing University, Cyberjaya this October and November 2011 in collaboration with Merah Putih Club of LUCT. We have close to 40 stalls selling Clothes, Accessories, Bags, Shoes, Knicks Knacks, Vintage Items, Homemade Cookies & Cakes, Handmade Items etc. Each vendor will be provided with 2 chairs, 2 units of 4 X 2ft. table and table cloth. Allocated booth space is 8 X 4ft.